Every now and then we all have computer problems. It’s a bummer. You can’t get onto the Internet and you need to do that ASAP. Sometimes, the screen gets all wiggly or gives you a message that it is shutting down and you scream, ’NO, I didn’t save it yet – wait! Aghhhh. Why didn’t I save it?” Bang head against computer. It may turn it on again, or you may have created a more serious computer problem. 1. 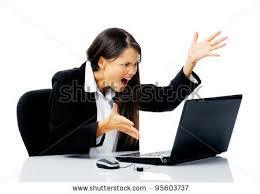 DON’T vent your frustrations out on on the Help Desk employees. They are trying their best to fix it. Word will get around how unreasonable (yes, they will say that) you are – not to mention your boss hearing it. In the scheme of proper and improper behavior, let’s not ‘bite the hand that feeds you’ and/or ‘don’t air dirty laundry’ to the public. They may be amused at first, but that gets old quick. 2. DO “keep in your department what happens in your department”- don’t blame others – your glitch may not be their fault. Otherwise, it starts to sound like “As the World Grumbles” or “Family Feud”. 3. Try to be patient. No one likes to have to wait for things or not be told what is going on. When things aren’t quite up to par technically, some of you want to hit the Panic Button, and do; others wait patiently for the air to clear and haven’t said a word. Shalom. 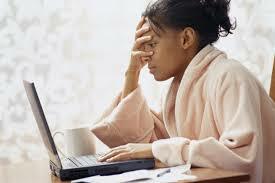 It is duly noticed by others in your group how you react under stress. 4. Read any article that explains systems problems, especially those dealing with adding on servers and LAN’s and how traffic is intricate and inter-related. You will see that they take time to develop, time to test and time to implement. Plus, it takes time to get the bugs out. We all know about bugs; we’ve all had them – the computer kind, that is. 5. Try to imagine the worst thing that could happen – like your company could put you totally in the dark, and you could get ERROR messages on everything that is out there. All of your reports and work articles could be frozen out there somewhere forever. They may not be backed up and lost forever. See, things could be worse. If you can get some screens, although that isn’t warm and fuzzy, it should be somewhat comforting. 6. While you’re pounding the keys harder than what they were made for, remember that you have the advantage of having a job and it is usually OK – except when the server is not working right? Yes, I do hear you and validate you – you know some really bad words — normally, you do like what you are doing. Come on, admit it, or you wouldn’t be so frustrated. That’s better. Now try to smile a little. Come on – that’s a smile? All right, forget about it. 7. Do not give in to the urge to sweep the computer off the desk onto the floor. Big mistake. Think of something pleasant instead. You can if you try. 8. Stop putting even more phone messages on the Help Desk line. They’ve already been inundated with questions asked and re-asked. Breathe in and out and think. Get up and go for a walk. 9. You look better. Uh Oh, your eyebrows are knitting together again. Relax. Think happy thoughts; remember, you’ll make up this time Somehow, Somewhere. Isn’t that a Barbra Streisand song? Oh, come on, that was a joke – stop throwing things. 10. 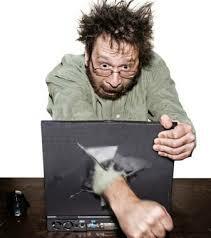 Whoops, you’re pounding away again – not good for the keyboard. And another call to the Help Desk — tsk tsk. You already ‘aired’ that annoyance twice already. Stop calling them. Yes, Stop. Oh, look, the system is up now. And they have fixed all the glitches. Now, admit it — wasn’t it kind of nice to take a little break? OK, OK, I’m out of here. Have you prayed and not had your prayers answered? If your feel your prayers aren’t being answered the way you want, God may have another Plan for you. His Will may have different directions for your life. God’s delays are not God’s denials. I’ve heard people say that God doesn’t answer their prayers. I’ve heard some, but fewer people talk about the prayers that God DID answer for them. God listens to ALL prayers; and all are answered, but sometimes not in the way we’ve asked for them. · 75% percent were Christian. · 64% say they pray more than once a day. · 56% say they most often pray for family members, with 3.3% saying that they pray for strangers. · A little over 38% say that the most important purpose of prayer is intimacy with God. · 41% say that their prayers are answered often. · 1.5% say that their prayers are never answered. 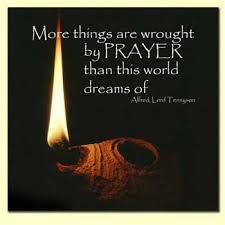 · Over 73% say when their prayers are not answered, the most important reason is because they did not fit God’s plan. · 5% say that they pray most often in a house of worship. · 79% say that they pray most often at home. · 67% say that in the past six months, their prayers have related to continually giving thanks to God. The U.S. Religious Landscape Survey, conducted by the Pew Research Center’s Forum on Religion & Public Life, shows that prayer is a common religious practice in America, with nearly six-in-ten adults in the U.S. saying they pray at least once a day. Americans still pray a lot. Ninety percent say they have a spiritual conversation with God daily, according to a recent study released by Brandeis University. Forty-five percent pray several times a day. The experience is very personal, with eight out of 10 beginning their prayers with a familiar greeting, like “Dear Lord” or “Hello Jesus. I say little prayers all during the day. Sometimes, I say ‘God, I hope I shut the coffee off’, or ‘God, please let me pass this test’. These ARE little prayers. And the majority of them are answered. And then there are the big prayers, ‘God, please make things right between me and my brother; or ‘Please, God, help me with this floating anxiety’; or ‘God, please let someone be there to pick up the phone’ in an emergency. And the major prayers, ‘God, please let him get well; or ‘God, let my test results come out OK’; or ‘God, please don’t let her die’. They are all prayers and they will all be answered, but some not in ways we want them to be. God knows what we want before we even pray for it. And sometimes he answers them the way we want……and sometimes they seem to go unanswered or denied. But, they aren’t. He hears us and His Will be done. God has a plan for all of us. And sometimes the things we pray for are not part of the plan He has for each of us. If our prayers aren’t answered the way we want them to be, it’s not because we are being punished or God is teaching us a lesson or He’s not listening. He may have an entirely different outcome planned. 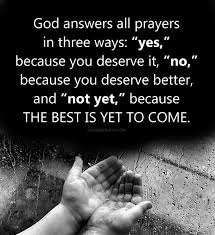 Some of my greatest joys in life have resulted from unanswered prayers. And some of my greatest emotional growth spurts have resulted from unanswered prayers. And some of my greatest memories and happiness are from God’s answered prayers. If you think about all the things we take for granted every day, and believe that ‘All Good Things Come From God’, you will find that your life has so many answered prayers every day that go unnoticed. Until you really think about them. Be patient; God has plans for all us. If it seems He is not answering your fervent prayer, He probably has another Plan in mind for you. Father really knows best. According to the Bureau of Labor Statistics, the following occupations will have the most job openings between now and 2018. These job openings occur due to the creation of new jobs or because workers retire, leave their positions or other reasons. Listed are the top 10 occupations that experts agree are the jobs will be are sorted according to the level of typical educational requirements of a graduate degree. “Faith is not a light which scatters all our darkness, but a lamp which guides our steps in the night and suffices for the journey.” Pope Francis, “Lumen Fidei”. As Grand Knight of Council 7122 this coming year, I hope to continue the “light” that the Knights of Columbus, through their faith and brotherhood, have contributed through volunteering in all OLSS ministries for Charity. Our Pope calls us to be the “Lumen Fidei”, the “light of faith”. Our faith should be as luminaries, a reflection of our belief and love of Christ to all of our parish. We are called to “step up” to assist the church, it’s members and the community. Our light of faith, by serving the church, shines on others as the light of Christ shines upon us.Going forward, we would like to place special emphasis on the meaningful proverb “Charity begins at Home”, particularly in regard to Operation Hope. We desire to continue the works of our church ministry and can only be effective if all members assist to augment our efforts to support our church and our pastor. To be successful, we need two or three additional assistants who can function in a backup capacity in the event the main (primary) member is out or unavailable. Having a succession plan in place is vital to the success of all of our ministry efforts! We thank you in advance for assisting our efforts as we support our Church and our pastor in any and all requests. May the “lumen fidei” shine brightly on you, your loved ones and all of your good works. 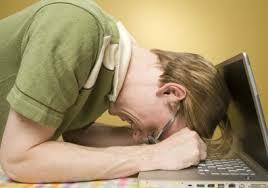 Employee to Human Resources: I want to get ahead on my job and I don’t know how or where to start. What can I do to make myself more visible? Job security is at an all-time low these days. Layoffs are rumored; hiring and salary freezes abound; bonuses and annual raises are delayed. For those who are sticking it out and their morale is getting low, what can they do to elevate their visibility; increase their skills set and/or increase their promotability? As an advisor, I always encourage continuing education. In these times, some firms have cut back on this benefit of reimbursement for education, but many have not. Check with Human Resources and find out what their current benefits entail. Some firms pay 100% reimbursement for a passing grade, including books, tuition, and fees. There’s no better deal than this; it’s equivalent to getting a super raise. 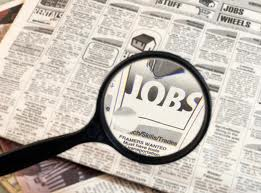 Plus, you will add higher learning and certified skill sets to your existing position. Many companies offer courses pertinent to your position, ie, computer courses for a computer analyst; legal courses for paralegals, etc. If you look into it, you may find that many companies are agreeable to allow courses not related to your job position to promote diversification of an employee’s skill. I can’t champion it enough – continuing education is a great benefit bestowed on employees by companies – don’t let it pass you by. The other thing I always encourage is networking. Networking is the process of gathering information and discovery through interactions with other people. You can network at company-given seminars, in-house training programs, local community-sponsored organizations that pertain to your discipline, ie, NALA ( (National Association of Legal Assistants). Every discipline at work has a professional organization that they support to keep abreast of changing laws and updating relevant information – your supervisor can enlighten you as to which ones they use. You can network at professional organizations in the community not associated with your workplace (Woman Business Leaders of Oshkosh) (Professional Businessmen Association) or you can join an Alumni Association associated with your college. There are many such organizations out there and joining one will add prestige to your resume. And keep you on top of current issues in your field and especially network other professionals like yourself for sharing of business ideas and work-related opportunities for advancement. A big plus to an employee’s advancement is to engage a mentor. As I mentioned in my article on mentoring I designed, implemented and managed my department’s mentoring program. The first thing we did was have the interested employees fill out a questionnaire on what skills they would like to learn, what disciplines they wanted to learn them and how would that help them in their present position. We sent a similar questionnaire to management asking them if they were interested in mentoring, sharing their business experience and how much time could they offer. When we got the questionnaires back, we set up a spreadsheet and matched the employee’s desired skills and other departments of interest to the offering management team mentors. On paper, we set up a match. As we all know, personalities play a large part in relationships and it is important that the mentor and mentee mesh. We then set up a wine and cheese get-together after working hours and invited the mentors and mentees. They mingled and discussed the program as well as getting to know the players. There are always ‘situations’ at work where some groups do not get along as well as they do with other groups. Some department heads don’t see eye to eye. This is human nature. You wouldn’t want to match up a mentee who’s boss did not get along with the mentor. Somehow these things put a wrench in things and thank goodness, they are few in number but they do sometimes exist. 1) Mentor and mentee drawing up an agreement consisting of shared roles and responsibilities; determining length of mentoring term (6 months to one year) and meeting times according to their work schedules. (Mentoring was done during work hours with approval of supervisors). 2) Evaluating the relationship at various points (at least mid-point and ending) within the agreed-upon time period. 3) Working out any minor concerns about the relationship; assuring to keep confidences and setting goals and making plans on how to accomplish goals. 4) Mentors using their knowledge, experience and background accomplishments as examples to help mentee identify and build on their own strengths. 5) Mentees showing initiative in planning their career, perhaps by writing a personal statement about goals and accomplishments. 6) Both parties utilizing listening skills in discussions. 7) Providing feedback from both mentor and mentee on their accomplishments, and how each derived organizational growth from their role. Many companies encourage mentoring as a human resource development strategy. It could lead to a promotion or lateral move to another discipline to acquire additional specialized skills/information as a step to a promotion. If you are considering being a mentee, it is an outstanding vehicle to learn the ins and outs of the higher level of management. You can also learn business acumen in how different specialized departments like Purchasing, Security, Tax work closely with other departments. This gives you an overall flow of how an organization is run and will aid you not only in your own department, but in future ones. For the mentor, it is a chance to channel his or her experience onto a protégé, who could in the future become a longtime ally or associate; it hones your leadership skills; it gives something back to the company in transferring business-specific knowledge and perhaps fulfilling company needs; it gives the mentor the opportunity to overview his/her own present skills, goals and accomplishments in a new-eyes light. He or she may even discover areas where they, too, may improve. For both, it will enhance their listening and business skills. If the mentor invites the mentee to attend one of his meetings, both will ‘see’ the meeting through their business eyes and their mentoring relationship eyes. This can result in valuable insights to both. There are so many positives to mentoring that I can’t think of many negative ones. It rarely, but could be a problem in the mentor’s or mentee’s personal behaviors, ie, conflicting meetings that interfere with the mentoring schedule; forgetting or being late for their meetings, being preoccupied with other matters while they are meeting, allowing interruptions or distractions, etc. The majority of relationships through our program were equally courteous, prompt, and best of all, enjoyed. Can you remember a time when someone gave you support, or important counsel, sound advice or positive reinforcement on something you were doing? Encouragement is an important support and guidance motivation given by a more knowledgeable person (such as a mentor) in helping a less experienced or knowledgeable person (mentee) to develop in some capacity. Many times, parents are mentors. They have the experience and know-how in “How the World Turns”. They may have gone to college, experienced love relationships, had children, bought houses, paid taxes, and countless other things. Hopefully, they are good mentors who encourage, support and guide their children in their everyday challenges. Sometimes, grandparents, aunts, uncles, cousins, or good family members are mentors. They are the ones to go to when one needs to know what can be done about a special issue; they either give good advice or advise options on how to work at it. We are indeed blessed if we have mentors in our lives. What if we don’t have a mentor? There are occasions when ‘two heads are better than one’ and additional input is needed. How does one acquire a mentor? Are there different avenues or vehicles for finding one? Yes, there are. There are personal mentors and organizational mentors. The personal mentor: Sometime during your lifetime, someone may take a special interest in how you are accomplishing a task. It may be in a teacher or principal in school. It could be a leader or coach in an activity in an athletic or after-school activity. Or a girl or boy scout leader in a social club. Or perhaps a pastor or spiritual leader in a church affiliation. A mentor is usually someone older and more accomplished in the task you are endeavoring. He/she will give you feedback on how you are accomplishing; give you advice or hints/solutions on how to continue; or reinforce how you are progressing. This is a one-on-one relationship which lasts over the time of the task’s duration. You might even seek someone out and ask them to be your mentor on a task. It doesn’t hurt to ask. Most people like to help and may feel honored that you chose them. If the person is agreeable, you could set up a schedule to go over the progress of what you are doing and the mentor can advise plusses and minuses. Depending on the personalities, this person could become a life-long mentor who can aid you in further tasks. Sometimes it evolves into a mentoring over a variety of life’s issues. Such an arrangement can benefit both the mentor and the mentee. And form a very special, honored relationship. A mentor can be rewarded by watching the mentee ‘grow’ in his mastery of overcoming or attaining the reason for the guidance. The mentee can be rewarded by achieving the self esteem and confidence of mastering what he overcomes or attains. I have to note that a mentor does not want to live the life for the mentee and should set the tone to make sure that the mentee does not become dependent on the mentor’s good will. A mentor should not have to listen to lamenting and negative inputs. The mentor is there to support and guide, not encourage ‘wallow and whine’. “Mentoring is a process for the informal transmission of knowledge, social capital, and the psychosocial support perceived by the recipient as relevant to work, career, or professional development; mentoring entails informal communication, usually face-to-face and during a sustained period of time, between a person who is perceived to have greater relevant knowledge, wisdom, or experience (the mentor) and a person who is perceived to have less (the protégé)” (Bozeman, Feeney, 2007). It is actually an agreement between a less experienced worker (mentee) and a business guru (mentor) in the company. Both understand that the purpose is for the mentor, through his or her own job experiences, to supply support and guidance to the mentee to aid in his/her career development. This is accomplished through human resource procedures which include matching temperaments, sharing written expectations, schedule guidelines, written goals and performance feedback. Since they are ‘gurus’ in the company, mentors may be department heads or V-Ps and are giving up a slice of time from their busy schedules. They have worked hard to acquire business acumen and their schedules should be respected and not abused. One must never forget or not show for a mentor/mentee meeting. If there is a conflict, his/her office should be notified timely. Nor should a mentee use the mentor’s time to complain about the company or their personal gripes. This is a business meeting and although personal info sharing may arise, it is a meeting to combine goals and ambitions into work performance and advancement. Most mentors who agree to programs like this show a desire and a willingness to give up time to help others, maintain a positive outlook, and are able to be realistic. Some business gurus may have mentoring as an objective on their own goals from their bosses if they need ‘soft skills’ in communicating with employees. They may need to hone up on listening skills and will thus have a strong interest in their own growth and self-development as well as their mentee. Business gurus usually have success orientation. That’s why they are where they are. 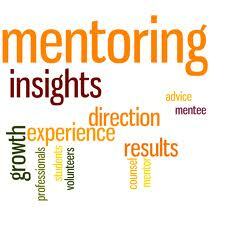 During my career development activities, I designed, implemented and maintained a mentoring program. I worked mainly with a department that encompassed state of the art technically skilled employees. These employees, in order to acquire additional integral business skills, development and promotion possibilities, had a distinct need to explore inter-related business disciplines. For those who had interest, mentoring exchanges were established with them and department heads such as Finance, Security, Legal, Logistics, Purchasing, E-Commerce, or wherever their interests were. It was very successful for those who were determined and focused. Some of them, with their sought-after technical skills were offered positions in the departments of their choice who had a need for the technical end of the specialized business. They are all inter-related at some point. And it helped the company reduce lay-offs by transferring valuable but excess tech persons to another discipline. A discipline that they were not only interested in, but had the background and experience of already knowing the company procedures. A win-win. This project was one of the most satisfying of all my projects to view first-hand, the many positive aspects and results of these relationships. 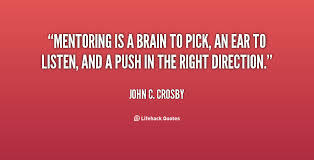 In another article on mentoring, I will outline the agreement arrangements between mentors and mentees and what each expects or should expect from the other.